Properties in Vaucluse average 4.7 out of 5 stars. Old house restored, quiet, beautiful environment. Property 13: Old house restored, quiet, beautiful environment. Property 21: Detached house for 2 people on land owner. 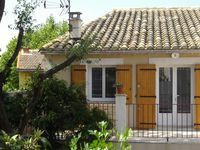 Property 28: House for rent in Provence for 4 persons with large pool. Property 30: Medieval charm and soaring vistas in the heart of Provence: what's not to love? Independent villa, air-conditioned, two steps from the village, quiet with private garden. Property 31: Independent villa, air-conditioned, two steps from the village, quiet with private garden. Cottage with pool in a quiet hamlet in the heart of orchards: authentic stay! Property 38: Cottage with pool in a quiet hamlet in the heart of orchards: authentic stay! We had a delightful two weeks at La Ferme St Roch at the end of September. The property is lovely, well equipped and well maintained, with spacious bedrooms, modern bathrooms, an excellent kitchen and a beautiful swimming pool. It&rsquo;s totally private, but once you walk through the gate it&rsquo;s a convenient, very short walk into town to the bakery and markets. Robion is an ideal location, situated at the foot of the Luberon mountain range and very close to Gordes, M&eacute;nerbes, Roussillon, Isle sur Sorgue, St. R&eacute;my and other well-known Provence spots. It&rsquo;s very easily accessible from either Avignon or Aix en Provence. We usually spent a few hours each day exploring the area and having lunch in one of the nearby towns, then made sure to return by mid-afternoon in time to swim and relax by the pool. One day we took a hike into the Luberon just behind Robion&rsquo;s old town. We had family and friends with us part of the time, and sometimes it was just the two of us. It couldn&rsquo;t have been any better. To top it all off, Sebastian was a perfect host. We couldn&rsquo;t have been more satisfied with the entire experience. Merci mille fois!